Receive this fabulous tutorial by email FREE with ANY order placed with me or paid class attendance in March 2010! With Vintage style all the rage, this tutorial will help show what creates the vintage feel, some great vintage techniques, tools of the trade and different vintage styles. 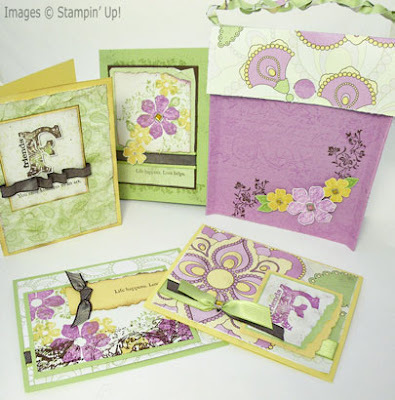 You'll enjoy the warmth, layers and texture of the four cards and coordinating vintage purse. This set makes a beautiful and stylish gift you can give for a birthday, wedding shower, graduation or even as a treat for yourself! 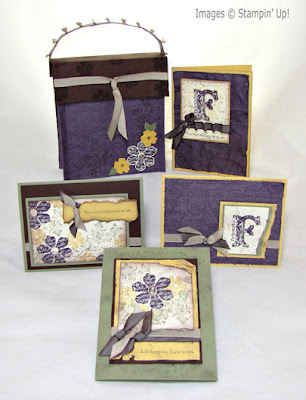 These projects feature the Vintage Vogue stamp set and Very Vintage Jumbo Stampin’ Around Wheel along with a fun assortment of tools perfect for creating the vintage feel. The projects combine warm soft colors, texture, layers and ribbon to create different types of vintage style. If you want MORE though, there's even an alternate colour scheme for more project ideas!